Since the beginning of the world it has been proven on several occasions that, in times of immense human suffering, threats to world peace or the destruction of the environment, the power of God descends to Mother Earth to manifest Itself as an Avatar in one human being to bring salvation and deliverance from our sins. In the year 1966, during a cyclonic storm at Melmaruvathur in India, a neem tree secreting sweet medicinal milk was uprooted to reveal the SWAYAMBU (an oval stone-like emanation). The power above revealed Itself in the form of the Swayambu and proclaimed that It had transmigrated into His Holiness Bangaru Adigalar and would give Oracles through Him to save the world. That was the beginning . . . . . Although there was initial opposition from His fellowman and the surrounding villages, as times passed the Oracles and miracles of His Holiness Bangaru Adigalar drew the attention of millions from near and abroad. The donations have been channeled into the various developments that are here today at Melmaruvathur (Map & Pictures) and have been used for innumerable social services provided by the Adhiparasakthi Charitable, Educational, Medical and Cultural Trust. Free medical care to a large rural community and a 2000 bed hospital which is partially completed and accepting patients. Educational Institutions from primary to post graduation in all branches of learning, paving the way for a full-fledged University. Promotion of modern scientific farming methods; proposed Agricultural Research Center at Isur. Employment provided to the rural community. 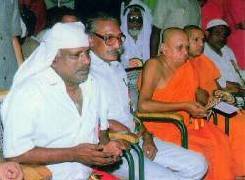 Social activities unifying all religions, races and cultures under one roof for the upliftment of society. Liberating women from the clutches of traditional protocols and involving them in spiritual and social activities. By tirelessly working to create an atmosphere of peace and brotherhood among all his devotees, Adigalar has earned the respect of everyone who comes to see him. 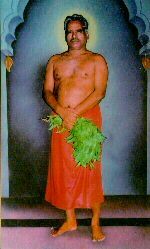 He himself never proclaims to be anything more than a devotee of Goddess Adhiparasakthi. He also says that he is to each what they would like him to be: an Avatar, a mother, a friend, or just an ordinary man. His humility and love for all are what inspire those who meet him. Though all his followers do not believe he is an Avatar, they pledge to unite and contribute, each in his own way, for the noble causes and deeds that benefit mankind at large. No one is required to believe what others do in order to receive the benefits of going to Melmaruvathur and seeing Amma. As long as you open your heart to God, however you think of Him/Her, and let go of your egoism you will receive Amma's blessings and guidance in your life. Word of Amma is spreading among religions and throughout India and the world. More and more people are coming to Melmaruvathur and soon there will be over one million different people traveling there every year. There have already been Europeans, Americans and others who have come to Melmaruvathur to seek His blessings. Most people can not come to the main temple in Melmaruvathur whenever they want to worship. 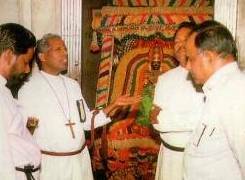 They are encouraged to set up small groups of devotees who meet regularly for worship and service. These groups are called mandrams. When they have enough people they can form a sakthi peetam and build a temple. Further information on the organization of the movement can be found here.